E-commerce businesses typically focus their attention on the digital world and high-tech business strategies. However, with digital communication becoming more common, handwritten cards have become an important way to set a business apart. Handwritten cards say more than what’s written on them. They tell your recipients you care about them and value their influence on your business. In a world where we’re bombarded with emails and instant messages, a handwritten card sets your e-commerce business apart. Here are some of the reasons your e-commerce business should send handwritten cards. Customers are the backbone of any e-commerce business. Sending your customers handwritten thank-you cards is a fantastic way to show them you value their patronage. When customers feel valued, they’re more likely to stay loyal to your business and recommend it to others. A handwritten card will help your e-commerce business feel more human. Since your business operates entirely online, customers don’t have the benefit of face-to-face interactions. They don’t see friendly smiles when they ask about products or check out with their shopping carts. Even voice interaction is often missing. Many e-commerce companies ditch call centers in favor of email and text-based support. 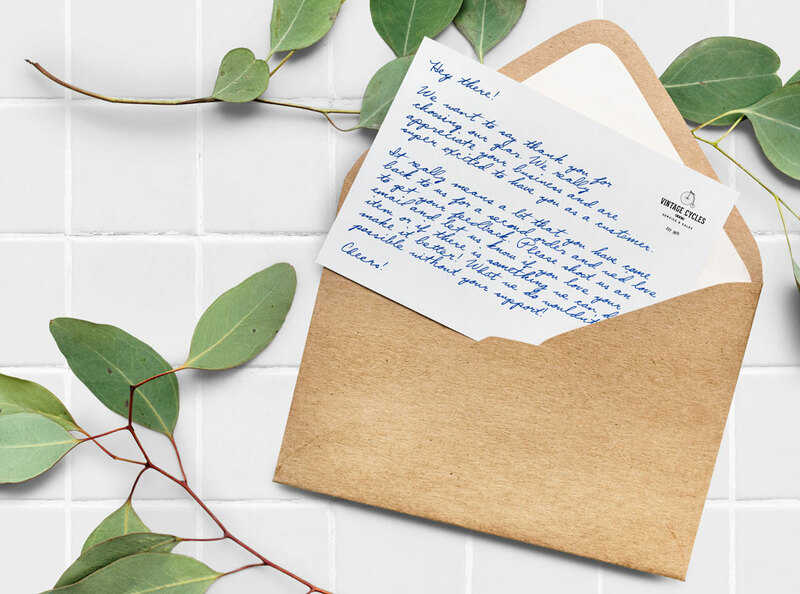 A handwritten thank-you card gives your e-commerce business some personality that can be sorely missing in the digital world. Send your customers a handwritten thank-you card after they purchase a product. These cards show your shoppers you appreciate them choosing your business and spending their dollars with you. You will stick in your customer’s minds and encourage them to spend with you again. Isolated sales matter, but don’t take your loyal customers for granted. Gallup research shows that customers who feel emotionally loyal to a company will spend 46 percent more with the retailer than shoppers without these emotional ties. Recognize repeated sales with special handwritten thank-you cards celebrating your loyal customers’ ongoing support. These thank-you cards deepen and reinforce the connection your customers feel with your e-commerce business. Loyal customers are the ones most likely to recommend your organization. Consumers are becoming increasingly skeptical of professional advertising. This positive word-of-mouth communication is an excellent way to attract new customers, boost sales, and increase brand recognition. People who refer others to your business show their trust in you. A handwritten thank-you card is a great way to show you value this trust and their willingness to recommend your business to their friends. Handwriting so many thank-you cards may seem overwhelming, but Handwrytten makes the process easier. Handwrytten integrates with popular customer management systems like Salesforce, SharpSpring, Zapier, and Amazon Seller Central. Whenever you make a sale or receive a referral, Handwrytten will create a personalized thank-you card. These cards are created with innovative text technology that is virtually indistinguishable from handwriting. The “bulk send” option helps growing e-commerce businesses keep pace. Don’t forget your employees when you’re expressing your gratitude through handwritten cards. Studies show employees value recognition more than financial incentives for a job well done. Simply saying “thank you” can make a good initial impression, but it fades quickly. A printed thank-you makes employees feel good every time they read and reread it. Sending an email or instant message are natural choices for an e-commerce operation, but studies show that nearly two-thirds of Americans prefer handwritten notes to digital communication. That means your employees will appreciate your praise a little more when it’s expressed on a handwritten card. Two key types of employees deserve handwritten cards from you. The first is the star achiever — the workers who go above and beyond to deliver outstanding results. When they do, a handwritten thank-you card lets them know their exceptional efforts haven’t gone unnoticed. But don’t forget the quiet achievers. The employees who are reliable and consistent are just as important for your company’s continued success. These employees probably won’t expect any praise, so your handwritten thank-you card will come as a pleasant surprise. Make sure your handwritten cards for employees are personal. Mention specifics about their achievements, the time they’ve spent at your company, and what you like about the way they work. These specific details ensure your employees know the value they bring to your organization as individuals. It also makes it clear that you’re praising your employees personally, rather than entrusting your secretary or personal assistant with the job. Many employees value praise and recognition, delivering it with a thoughtful handwritten card will have several positive effects. Giving your best employees handwritten cards is likely to boost their morale. When your employees feel appreciated and valued, they’re more likely to work harder and stay with your organization. Getting ahead in the business world is all about making connections. Handwritten cards are a valuable tool for strengthening these business bonds. They’ll also cut through the digital communication clutter. The average office worker receives 147 emails every day. In contrast, American households received just one personal letter every seven weeks in 2011. As postal use continues to decline, those personal letters are even less frequent today. At a time when personal letters are so rare, the handwritten cards you send are sure to stand out. Send a handwritten card shortly after meeting a new potential investor, supplier, or another kind of business contact. Your card will feel like a natural extension of the personal connection you’re already forging. A handwritten card is a great way to express the positivity you feel about your relationship and what it holds for the future. A handwritten card can also help convince a potential new employee to work with you. The best candidates may have several job prospects. Sending a handwritten card after your initial meeting will make you and your company seem more welcoming and caring. Your card will also show how much you value the candidate and the expertise they would bring to your organization. Employees want to be valued and work in supportive environments. Your handwritten card could convince a candidate your job is right for them. While emails and phone calls are usually the most efficient way of communicating regularly with ongoing business contacts, sending a handwritten card can be a good way of getting a business relationship back on track. If you haven’t touched base with a business contact for a while, reaching out with a handwritten card is a great way to get the connection back on track. If you’re reaching out to a customer who hasn’t purchased from you in some time, you might include a gift voucher or promotional code to lure them back to your business. Consider setting up an alert in your customer management system that tells you when customers haven’t purchased from you in six months or more. Make sure to mention that you hope they’re enjoying the products they purchased in the past to ensure your card doesn’t seem too salesy. When customers contact you with feedback, whether it’s positive or negative, they expect a conversation. Handwritten cards are an excellent way to thank them for taking the time to reach out to you and make sure they received what they wanted from their interaction. It’s smart business practice to contact customers who share negative feedback and try to get them back on side. However, many businesses don’t follow up to determine whether they’ve achieved this goal. If a customer doesn’t feel you’ve resolved an issue to their satisfaction, they’re unlikely to reach out again. Instead, they’ll probably avoid your business and tell their friends about their poor experience. Receiving a handwritten card lets disgruntled customers know you care. Make your card heartfelt yet upbeat. Let the customer know you appreciate them bringing the issue to your attention. Apologize for any inconvenience caused and state that you hope you’ve addressed the issue to their satisfaction. If you have changed your business practices as a result of the problem, let them know. Invite the customer to get back in touch if the issue hasn’t been dealt with sufficiently. If the customer was left unsatisfied, your handwritten note could reopen the lines of communication and help bring the customer back on side. While companies often reach out to correct criticism, they’re less likely to follow up on praise. Reaching out with a simple handwritten thank-you card lets satisfied shoppers know you value their feedback too. This can further boost goodwill towards your organization. Consider asking your happy customers whether you can use their positive feedback in your advertising or website copy. The festive season is the perfect time to reach out to all your business contacts with handwritten holiday cards. Employees, customers, suppliers, and other business contacts will all appreciate knowing your organization is thinking of them during the festive season. Don’t forget the assistants, either. These professionals work hard scheduling meetings and forwarding messages to your business contacts. Letting them know those efforts are appreciated with a holiday card can really lift their spirits. Holiday cards also put your e-commerce company in the front of your customers’ and business contacts’ minds. If customers and contacts haven’t connected with your business for a while, receiving a thoughtful holiday card could give them the push they need to reengage. Resist the temptation to use your holiday card as an opportunity to sell. While including your business name is appropriate, adding a business card can make your holiday card seem like a marketing gimmick instead of a genuine gesture. Including a promotional code, on the other hand, can seem thoughtful. Promotional codes make better holiday gifts than gift vouchers, as they encourage your business contacts to spend more than you’re giving. This is crucial when you’re sending so many cards at once. Timing is everything. A holiday card seems less thoughtful if it arrives after the holiday season. This can be a real danger when sending holiday cards to businesses who may close down well before December 25. Sending your cards shortly after Thanksgiving should ensure they arrive in plenty of time. Also remember that the world is a diverse place made up of people from several different faiths and backgrounds. Keeping your holiday card religiously and culturally neutral ensures that your gesture won’t cause offense. Also consider finding a card that’s unique. Winter scenes are timeless, but they are also a little overused. Think outside the box and use a card with a quirkier design to really stand out. Distributing a bulk collection of holiday cards is relatively easy. Sending birthday cards to these same contacts takes a little more effort, as it’s an ongoing process throughout the year. However, the recipients will appreciate you remembering their special day and feel that you value their contribution to your company. They might even tell their friends about the gesture or post a photo of your thoughtful card on social media. As with sending holiday cards, making sales shouldn’t motivate you to send a birthday card. However, depending on your business, a promotional code or company gift voucher could make a great birthday gift. Since your birthday cards will be spaced out through the year, your generosity shouldn’t negatively impact your cash flow. Don’t be too stingy, though. While you shouldn’t gift more than your company can afford, your recipient may resent chipping in a substantial amount to use your birthday “gift.” Consider how much your products cost when selecting the right gift voucher amount. Modern technology makes sending handwritten birthday cards to your employees, customers, and other business contacts easier than ever before. Record the birthdays in your customer management system, then automate the creation and sending process with a service like Handwrytten. The high-tech world provides many business advantages, but when it comes to communication, it pays to go back to basics. Cut through the noise and really make an impact on your customers, employees, and other business contacts sending handwritten cards.